Barcelona, Bayern Munich and Juventus have more players on Uefa's 40-man shortlist for its team of the year than the entire Premier League combined. Barcelona provide eight players, while Bayern and Juventus both have six. The Premier League contributes five players: Manchester City keeper Joe Hart, team-mates Sergio Aguero and Kevin De Bruyne, Chelsea's Eden Hazard and Arsenal's Alexis Sanchez. Real Madrid's Gareth Bale joins Hart as one of two British players on the list. 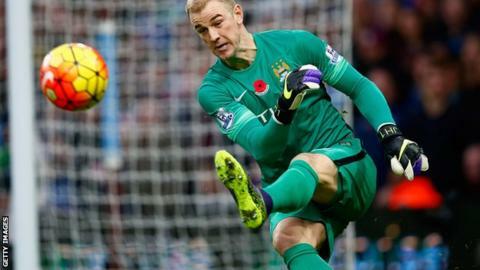 Hart has been nominated alongside Juventus keeper Gianluigi Buffon, Manuel Neuer of Bayern Munich and Ukrainian side Dnipro's Denys Boyko. The shortlist features four goalkeepers, 12 defenders, 12 midfielders and 12 strikers. Fans can vote for the team of the year on Uefa's website until 5 January. Goalkeepers - Joe Hart (Manchester City), Gianluigi Buffon (Juventus), Manuel Neuer (Bayern Munich), Denys Boyko (Dnipro). Defenders - Leonardo Bonucci (Juventus), David Alaba (Bayern Munich), Giorgio Chiellini (Juventus), David Luiz (Paris St-Germain), Dani Alves (Barcelona), Thiago Silva (Paris St-Germain), Jerome Boateng (Bayern Munich), Ricardo Rodriguez (Wolfsburg), Javier Mascherano (Barcelona), Diego Godin (Atletico Madrid), Gerard Pique (Barcelona), Sergio Ramos (Real Madrid). Midfielders - Grzegorz Krychowiak (Sevilla), Kevin De Bruyne (Manchester City), Ivan Rakitic (Barcelona), Arturo Vidal (Bayern Munich), Eden Hazard (Chelsea), Claudio Marchisio (Juventus), Marco Verratti (Paris St-Germain), Yevhen Konoplyanka (Sevilla), Andres Iniesta (Barcelona), James Rodriguez (Real Madrid), Paul Pogba (Juventus), Hakan Calhanoglu (Bayer Leverkusen). Forwards - Gareth Bale (Real Madrid), Thomas Muller (Bayern Munich), Lionel Messi (Barcelona), Zlatan Ibrahimovic (Paris St-Germain), Robert Lewandowski (Bayern Munich), Neymar (Barcelona), Antoine Griezmann (Atletico Madrid), Alvaro Morata (Juventus), Sergio Aguero (Manchester City), Luis Suarez (Barcelona), Alexis Sanchez (Arsenal), Cristiano Ronaldo (Real Madrid).